Ram has been having a big week recently. 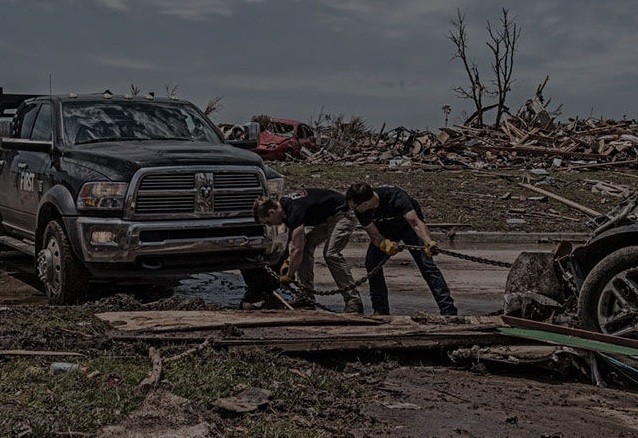 They have already captured the the attention of truck lovers by showing off their new entries into the heavy duty truck category with the reveal of the 2013 Ram 2500 and 3500. It appears they are wanting to make sure to not have that enthusiasm go anywhere and have a new way of keeping people aware of their amazing upcoming product line. In Auburn Hills, Michigan, the Chrysler Group headquarters is sporting a new look. Draped around the front of the building is a fifteen stories high, 140 feet wide, 210 feet tall wrap that is all about the 2013 Ram 1500. It’s a remarkable sight that plays very much into the slogan that Ram has of “Guts, Glory, Ram.” Chrysler is so proud of the new truck, they want anyone within sight to be reminded of it. 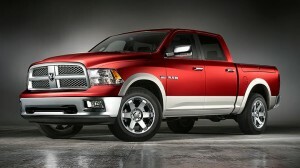 The 2013 Ram 1500 has a 3.6-liter Pentastar V-6 engine under the hood and has an all-new air suspension system. The truck also has the best-in-class 25 miles-per-gallon fuel economy. The new Ram will also have a stronger frame with more high-strength steel. Be sure to check out the full Ram truck line-up online at Bayside Chrysler Jeep Dodge Show-Room. 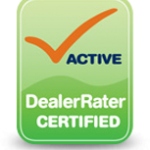 You can also view our new and pre-owned inventory. Don’t forget to like our Facebook page and follow us on Twitter for more Ram news! 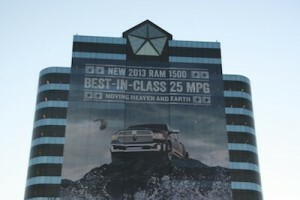 Ram sales have been seeing a good increase as the rebounding auto industry rolls on. To deal with this current state of demand, Chrysler is looking to increase production by adding a third shift at another plant. The Wall Street Journal is reporting that the decision hasn’t been finalized yet, Chrysler is still actively monitoring their truck sales to figure out if the additional shift is worth it. They want to ensure that the demand is going to stay around to justify the increase. As of yet, no official announcement has been made on a deadline for the decision. If the additional shift happens, the plant that will be getting the boost in production will be the Warren Truck Assembly Plant in Michigan. The shift would be adding 1,000 workers to the already 2,500 staff. Ram sales have been enjoying a new and steady growth of sales as the industry as a whole is clawing its way back from bankruptcy. Just this year, the truck maker sold 117,373 year to date, a 20% increase from last year. The strong sales are expected to continue into the second half of this year with 14.2 million vehicles expected to be sold this year. The reason why Ram’s sales have been coming back are seemingly due to many factors. First, the economy is finally seeing a steady recovery and people are wanting to go out and get themselves a new vehicle. Another reason is that gas prices, just months ago being alarmingly high, have been falling gradually and often. When gas prices are up, people tend to flock to the more fuel efficient models, which explains why many hybrid sales have increased. Whatever the reason, it’s clear that Rams are a go-to product for people looking for the best quality trucks on the road. Visit us online at Bayside Chrysler Jeep Dodge and take some time to browse the Ram showroom. Be sure to like us on Facebook and follow us on Twitter to stay up to date on all the Ram Truck news.